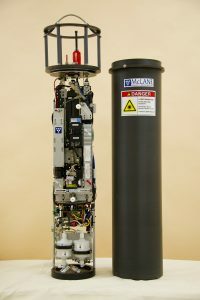 The McLane Imaging FlowCytobot (IFCB) is an automated submersible imaging flow cytometer that generates images of particles in-flow taken from the water. It uses a combination of flow cytometric and video technology to take high resolution photos of suspended particles. Laser-induced fluorescence and light scattering from individual particles are measured and used to trigger targeted image acquisition. The data are then transmitted to shore in real time. Photos collected during continuous monitoring can be processed externally with automated image classification software. The images can be classified to the genus or even species level with a demonstrated accuracy comparable to that of human experts. The IFCB generates high resolution (∼3.4 pixels/micron) photos of suspended particles in the size range <10 to 150 μm (such as diatoms and dinoflagellates). The instrument samples continuously at 15ml of sea water per hour, and depending on the target population it can generate up to 30,000 high resolution images per hour. The IFCB can be used in the lab for bench top analysis or at a pier or other wired deployment. The housing and fluidic components are rated to 40m. Unattended deployment (6 to 9 months) is possible as IFCB’s automated operation includes anti-fouling procedures and periodic standard analysis to monitor instrument performance.